Tennis elbow is a common condition that causes pain around the outside of your elbow. In spite of its name, this condition is often the result of everyday activities, not just playing a sport. Anyone can get it, particularly as you get older. It usually clears up on its own with self-care like gentle exercise. Tennis elbow is a type of tendinopathy, which means it affects your tendons. It develops when the ‘common extensor tendon’ that joins your forearm muscles to the outside of your elbow thickens and swells or develops small tears. This causes pain and tenderness. Tennis elbow is a common condition that affects between one and three people in every 100. Anyone can get tennis elbow, but you’re most likely to get it when you’re aged 40 to 50. You can get it in both arms, but it usually develops in the arm you use most. So if you’re left-handed you’ll probably get it in your left elbow. It’s likely to get better over time, unless you keep doing the activities that caused the problem. Depending on how severe your tennis elbow is, it can last between six months and two years. Sometimes, it can come back again in the future. The most common symptom is pain and tenderness on the outside of your elbow and in the muscles of your forearm. This shouldn’t extend to your hand, fingers or upper arm. Your symptoms may develop gradually overtime and you may not be able to link them to any particular event or injury. But they could be connected to a recent change in your sporting activity or work, including the techniques or equipment you use. You’ll usually notice the effects one to three days afterwards. Occasionally a single action, like lifting a heavy object, can cause sudden pain in your elbow. The pain can vary from mild discomfort to severe pain that keeps you awake at night. It may stop you doing everyday things like holding a cup. Your pain may get worse when you grip something like shaking someone’s hand. Repetitive wrist movements, bending your wrist backwards against a force, or lifting a weight can also increase the pain. You may also find that you have a weak grip and a stiff or mildly swollen elbow. But, generally, you’ll still be able to move your elbow normally. Many people with mild symptoms of tennis elbow find that their pain eases with rest and self-help treatments. If your symptoms don't improve after four to six weeks, see your GP for advice. If you have severe elbow pain, can't move your elbow or have loss of feeling, contact your GP straightaway. You may not need to see a doctor if you think you have tennis elbow. You may be able to treat it at home. But if your symptoms get worse and self-help and over-the-counter painkillers aren't working, contact your GP for advice. Your doctor will ask you about your symptoms and examine you. They’ll look for any swelling, tenderness or inflammation, and problems moving your elbow and wrist. You may be asked to carry out different movements like gripping something. Your GP may ask about your medical history, hobbies and work. They’ll usually be able to diagnose tennis elbow by examining your arm, and asking how your symptoms developed and what makes them worse. Your condition is likely to settle down, so you probably won’t need further tests. If your doctor refers you to a specialist, they may ask you to have some imaging tests, most likely an ultrasound scan. Ultrasound uses sound waves to produce an image of the inside of the body and can show how much the tendon is damaged. You may also have other tests, such as an X-ray, to rule out other causes of your pain like a broken bone or osteoarthritis. There are plenty of things you can do to treat your symptoms yourself, especially if they are mild. Some of the main ones are described below. If your symptoms don’t resolve after six weeks or so, your doctor may want to re-examine you. They’ll check if you’ve made any changes to the activities you do and if you’re back at work. Rest your elbow and tendon. But don’t rest it completely for more than a few days or your elbow joint may stiffen and your arm muscle may get weak. If your symptoms get worse because of an activity you do at work, contact your employer's occupational health adviser, if available, or talk to your employer. Ask if you can change your tasks to allow your arm time to recover. If you need to continue some activities, take regular breaks, including at work. Lift objects with your palm facing up, not down, as this will put less strain on your damaged muscles. But try to avoid lifting and gripping where you can. A cold compress (like a bag of frozen peas) or heat pack (such as a hot water bottle) on your elbow may temporarily relieve the pain. You can buy reusable ice packs, heat pads and microwavable heat bags. Don't apply ice or a heat pack directly to your skin, as it could damage it. And don’t leave it on for more than 15 minutes every couple of hours. You might try wearing a special clasp, strap, splint or brace around your forearm when doing activities that could trigger tennis elbow. These aim to relieve pressure on your tendon and support your arm muscles. This can be combined with physiotherapy. ‘Deloading tape’ may relieve severe night-time pain and help you sleep. Although these products are safe, there’s not much proof that they work. If you want to try one, you can buy them from some physiotherapists, pharmacies and sports shops. Always follow the instructions that come with your product and don’t hesitate to ask your doctor or physiotherapist if you need more advice. If you need pain relief, you can take over-the-counter painkillers such as paracetamol or ibuprofen. Non-steroidal anti-inflammatory drugs (also known as NSAIDs), such as ibuprofen, are available as a cream or gel. You can put this directly on your skin, or you can take them as a tablet. If you use creams or gels with ketoprofen in, you’ll need to protect your arm from sunlight for two weeks. Your doctor may suggest you also take other medicines to avoid common side-effects of NSAIDs like indigestion, if you’re prone to stomach upsets, for example. Always read the patient information leaflet that comes with your medicine. If you have any questions, ask your pharmacist for advice. The treatment for tennis elbow partly depends on how long you've had it and which treatments you've already tried or prefer. To make a full recovery, you’ll need to rest your arm and avoid the activities that make it worse. This also gives your tendon time to heal. Most people find that their tennis elbow improves within a year. See our Self-help section for more information. If your tennis elbow doesn’t get better, comes back, or your pain is severe, your GP may suggest a steroid joint injection. A steroid (a type of hormone) will be injected into the painful area of your arm. Most people find steroid joint injections ease their pain at first but they can stop working after a few weeks. There are some risks linked with steroid joint injections. See our FAQs section below for more information. If you have any questions, ask your doctor to explain how these risks apply to you. Your GP may refer you to a physiotherapist. A physiotherapist is a health professional who specialises in maintaining and improving movement and mobility. They may try various techniques to reduce your pain. These may include exercises, deep tissue massage, ultrasound therapy and laser therapy. Once you’re in less pain, physiotherapy can help you strengthen and stretch your elbow and recover more quickly. Your physiotherapist may give you advice on how to do things to help prevent or ease your pain. They may also show you exercises you can do at home to strengthen your tendon. Experts don’t recommend acupuncture for treating tennis elbow. This is because there isn't enough proof that it will help your tennis elbow. See our FAQs for more information. Speak to your physiotherapist or GP before trying acupuncture. If you decide to try it, check that your therapist belongs to a recognised professional body. If self-help, medicines and physical therapies don’t seem to be working after six months or so, your GP may refer you to an orthopaedic consultant. This is a specialist in treating musculoskeletal problems, including conditions that affect joints such as the elbow. They will consider other treatment options for tennis elbow like surgery or the non-surgical ones listed below. Although these are usually safe, there isn't enough proof that they work well. Your doctor can explain how well these might work for you and any risks involved. Some of these are described below. You can have an injection of Botox (botulinum toxin A) into your elbow. This will temporarily prevent the muscles moving and allow them time to rest and heal. A downside of this treatment is that you won’t be able to move some of your fingers for a few months. You may be able to have shock wave therapy. This passes high-energy shock waves through the skin of the painful area, which can help to ease pain. If your tennis elbow hasn’t improved after a year or more of trying various treatments, your doctor may suggest you have surgery. This is an option if it’s really painful or disabling. Surgery aims to repair or remove the damaged part of your tendon. It will usually be ‘keyhole’ surgery or through a small cut. You’ll probably be able to go home the same day. You should take a couple of weeks off work, longer if you do a heavy manual job. A programme of gentle stretches at home and physiotherapy will help you to recover. Tennis elbow is usually caused when the muscles and tendons become damaged. This can happen if you’re repeating the same motion over and over again. There’s more risk if you’re generally in poor physical condition, your arm muscles are weak or a previous injury affects how you use your elbow. You could have a problem if you do a lot of exercise after being fairly inactive for a long time. You’re also at risk if you use the wrong technique or equipment for the task you’re doing. Having tennis elbow once means you’re more likely to get it again. If you play a racquet sport, such as tennis or badminton, it can cause tennis elbow, mainly from over-forceful backhand shots. But there’s less risk now racquets are lighter. And you may be surprised to know that most people who get tennis elbow don't play tennis. The most common cause of tennis elbow is doing activities where you’re repeatedly and forcefully gripping and twisting your wrist. This can include jobs and hobbies like plumbing, carpentry, gardening, decorating, laying bricks, using a screwdriver, sewing, painting and knitting. Handling heavy loads can also cause tennis elbow, especially if you’re not used to it – like carrying a new baby. There’s also a strong link between using a computer keyboard or mouse for long periods and developing tennis elbow. This is because these activities can tear the tendons in your arm. How quickly tennis elbow develops may depend on how big these tears are. You may be able to prevent tennis elbow by taking steps to protect your arm muscles and tendons. A few precautions are listed below. Think about the repetitive actions you do and try to avoid or change them. Take breaks during or between tasks that involve using your arms. If you're lifting, carry the weight close to your body and keep your palms facing upwards. If you play a sport, make sure you're using the right technique. You may want to get a coach to help you with this. Make sure you’re using equipment that’s suitable for you. For example, make sure your racquet handle is the right size. The right exercise can help stop symptoms coming back. Physiotherapy also helps by building up strength in your elbow. Will steroid injections help tennis elbow? Will steroid injections help tennis elbow? A steroid joint injection directly into the area around your elbow may reduce the pain, but it can’t cure tennis elbow. Your doctor may recommend you try one if your tennis elbow is causing severe pain and other treatments don’t help. The injection may be done by your GP or a specialist at hospital. You’ll probably have a local anaesthetic injected at the same time to stop it hurting. A local anaesthetic completely blocks pain from the area and you’ll stay awake during the procedure. You may find your elbow hurts more for a few hours or days after the injection before the pain starts to fade. Your pain may be eased for a few weeks after an injection, but may come back later. There’s little proof to show that these injections work in the long term. You can usually have up to three steroid joint injections, and these should be at least six weeks apart. Steroid injections have some side-effects (unwanted but mostly temporary effects you may get after having the injection). They can cause loss of colour to your skin and damage beneath it. They may also weaken the tendon. Your doctor will discuss these with you before you agree to have anything done. Can tennis elbow be treated with acupuncture? Can tennis elbow be treated with acupuncture? Experts don’t recommend acupuncture for tennis elbow, because there isn't enough proof yet that it works. Acupuncture is a complementary treatment that involves puncturing the skin with needles in specific points to relieve pain in various conditions. Studies into acupuncture use for tennis elbow have had mixed results. Some studies suggest that acupuncture may help relieve pain for a little while, but others didn’t find a benefit. If you want to try acupuncture for elbow pain, check that your therapist is registered with a professional body. The British Acupuncture Council and the Acupuncture Association of Chartered Physiotherapists (AACP) have lists of members trained to provide acupuncture. What's the difference between tennis elbow and golfer's elbow? What's the difference between tennis elbow and golfer's elbow? Tennis elbow causes pain around the outside of your elbow that may spread to your forearm. Golfer's elbow is similar to tennis elbow, but the pain occurs on the inside of your elbow. You can get it if you overuse the wrist tendon attached to the inside of your elbow. It doesn’t affect the elbow joint itself. Golfer's elbow is less common than tennis elbow. It often comes on more quickly. It can be caused by any sport or other activity that involves gripping or throwing, repetitive elbow movements, and vibrating tools. This might include DIY or computer use. People who smoke or are obese are at greater risk. 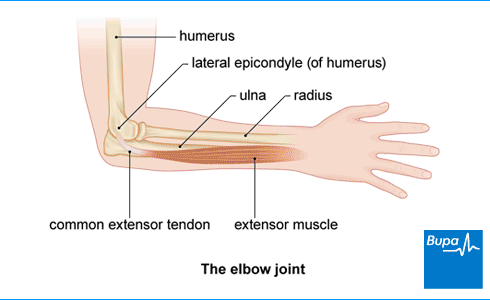 The main symptoms of golfer's elbow are pain and tenderness to the inside of your elbow. This may get worse when you twist your wrist to open a jar, for instance. Sometimes you may have a tingling and numb sensation in the fourth and little finger of your hand. Treatment of golfer's elbow is similar to that of tennis elbow. Acupuncture is a type of therapy that involves inserting fine needles into your skin at specific points, to help treat health problems and conditions.